“The Answers Are Coming from the Bottom”: Legendary Detroit Activist Grace Lee Boggs on the US Social Forum and her 95th Birthday | Democracy Now! Detroit-based radical organizer and philosopher. Born to Chinese immigrant parents in 1915, Grace Lee Boggs has been involved with the civil rights, Black Power, labor, environmental justice, and feminist movements over the past seven decades. Along with her late husband Jimmy Boggs, Grace has been at the forefront of efforts to rebuild urban communities. In 1992, she co-founded the Detroit Summer youth program to renew her city. Grace Lee Boggs turns ninety-five this week and is speaking at several events at the US Social Forum. AMY GOODMAN: We’re on the road in Detroit on this, the opening day of the US Social Forum. Thousands of people are here for one of the largest gatherings of grassroots activists and community organizers in the country. The event this week marks the second time the Social Forum has been held in the United States. The first one was three years ago in Atlanta. Detroit is a city with one of the highest unemployment and foreclosure rates in the country. But to many longtime Detroit-based activists, the city today is not just a picture of devastation and ruin. To them, Detroit is a city of hope, a place that seeks to nurture sustainability and community building. Last night, Democracy Now! 's Anjali Kamat and I spoke to the legendary Detroit-based radical organizer and philosopher Grace Lee Boggs. Born to Chinese immigrant parents in 1915, Grace Lee Boggs has been involved with the civil rights, Black Power, labor, environmental justice, and feminist movements for over the past seven decades. Along with her late husband Jimmy Boggs, Grace has been at the forefront of efforts to rebuild urban communities. In 1992, she co-founded the Detroit Summer youth program to renew her city. Grace Lee Boggs turns ninety-five this week and is speaking at a number of events at the Social Forum, including a public conversation with Immanuel Wallerstein. On Monday night, we visited Grace Lee Boggs at her home in Detroit on the east side, where she has lived for over fifty years. The city is considering declaring her home to be a historical landmark because it has served as an incubator for countless social justice organizations. We asked Grace Lee Boggs to talk about the importance of the US Social Forum coming to Detroit. GRACE LEE BOGGS: You know, the World Social Forums began after the Battle of Seattle in 1999. And the slogan, “Another World Is Possible,” emerged out of a completely new mentality, when people recognized that essentially those in control are dysfunctional and that the old social democracy dependence on those in power to give you things, that period is over. And I think it's really wonderful that the Social Forum decided to come to Detroit, because Detroit, which was once the symbol of miracles of industrialization and then became the symbol of the devastation of deindustrialization, is now the symbol of a new kind of society, of people who grow their own food, of people who try and help each other, to how we begin to think, not so much of getting jobs and advancing our own fortunes, but how we depend on each other. I mean, it’s another world that we’re creating here in Detroit. And we had to. I mean, we didn’t do so because we are better people than anybody else, but when you look out and all you see is vacant lots, when all you see is devastation, when all you see — do you look at it as a curse, or do you look at it as a possibility, as having potential? And we here in Detroit had to begin doing that for our own humanity. ANJALI KAMAT: So what do you think the rest of the United States can learn from Detroit? GRACE LEE BOGGS: Well, I’m hoping they will learn, and I spoke to two young groups today, one of them from California and another one from Ithaca, New York. Downtown they had come in vans for the Social Forum. I hope they understand from Detroit that all of us, each of us, can become a cultural creative. That’s what’s taking place. We are creating a new culture. And we’re not doing it because we are such wonderful people. We’re doing it because we had to, I mean, not only to survive materially, but to survive as human beings. We couldn’t give up. And that’s why I think — that’s what I hope people will learn, because the United States is going through some difficult times, and unless we understand that, and that that is what it means to evolve, not — to see what is negative as a potential positive. AMY GOODMAN: Grace Lee Boggs, we’re here with you in Detroit at the time of the US Social Forum — Detroit, the center of the fossil fuel economy — at a time where, in the Gulf of Mexico, it’s experiencing the worst environmental catastrophe in US history, the BP oil geyser. The wars in Iraq and Afghanistan are continuing. How do you put these together? And what needs to be done about them? 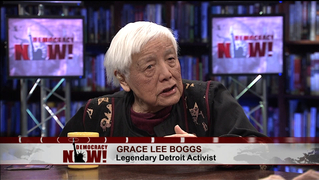 GRACE LEE BOGGS: Well, I think we have to see this as an opportunity and not just as a danger. I mean, it’s difficult to do that and look at the catastrophe in the Gulf and to look at what’s happening in Afghanistan and not think that the world has come to an end. But it’s a fantastic opportunity to — you see this T-shirt? It says, “Revolution is evolution.” It’s this fantastic opportunity to advance our humanity, to become more creative, to know that there are other ways to live and the way that we have lived has been at the expense of so much, so many other people and so many of the earth, and that we don’t have to live that way, that that only was only 300 years, that before that, people thought that the earth was more important than land and that work was more important than a job. This capitalist society has not lasted forever; it’s only a few hundred years old. AMY GOODMAN: Your assessment of how President Obama is dealing with these issues? Exacerbating them or solving them? GRACE LEE BOGGS: Well, I think that anyone who attempts a top-down solution can’t succeed. And I don’t think that, from the very beginning, he was so close to the grassroots. I think that he had — I think he — I don’t know. I remember asking Bill Ayers once, who knew Obama in Chicago, “How would you characterize him?” He says, “He’s a very ambitious person. He believes in advancing and climbing the ladder.” A lot of people believe that, that when you climb the ladder, and you end in the White House, and you have the Pentagon, and you don’t — and you rehire Bob Gates and Lawrence Summers. It’s very sad. It’s very sad. But I think it’s very helpful to understand that, you know, when — I’m going to be talking to Wallerstein. Wallerstein understands how the feudal lords could not run European society, how the serfs were running into the cities, how disease was spreading, and they became dysfunctional. And I think we see the dysfunction in the White House. We see the dysfunction at the top level. We see how they propose top-down solutions for education, for example: testing, more testing, more standardized testing, punishment. The answers can’t come from the top. And that’s why Detroit’s so important, why the Social Forum is so important. The answers are coming more from the bottom. AMY GOODMAN: Grace Lee Boggs, speaking to us at her home here in Detroit, one of the founders of Detroit Summer. This week she turns ninety-five years old, with a major celebration here at the US Social Forum, where 20,000 people are expected to gather. The US Social Forum begins today. This is Democracy Now!, democracynow.org, the War and Peace Report. We’re broadcasting from Detroit. When we come back from the break, the newly elected president of the United Auto Workers, Bob King. Stay with us.